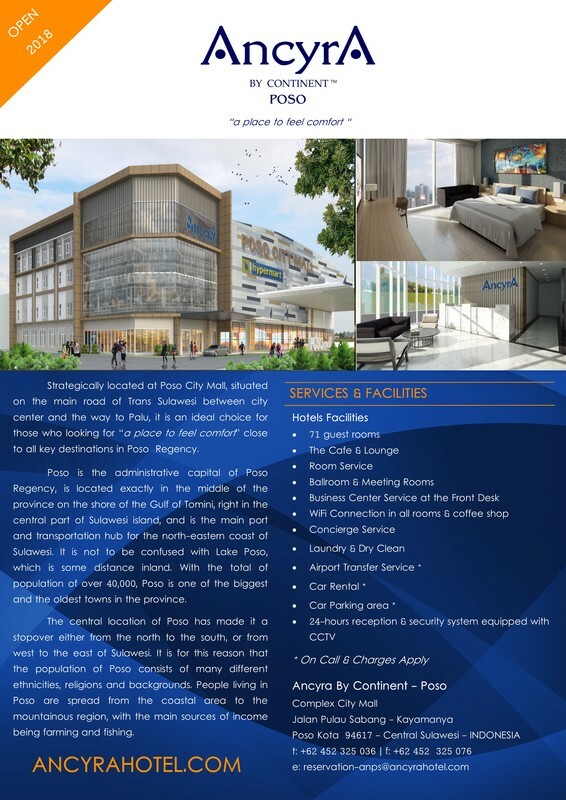 A smart international hotel in Poso - Central Sulawesi located one complex of Poso City Mall, the only and first shopping destination in Poso, Ancyra By Continent - Poso is the smart choice for savvy business and leisure travellers. Located just 20 minutes drive from Kasiguncu Airport, the hotel is situated within close proximity to all business and government offices. Featuring 71 modern design rooms, Ancyra By Continent - Poso offers the best location combined with the best value, for an affordable and hassle-free stay in Poso. Start the day right with our free Breakfast at the Cafe & Lounge or Grab and Go option & stay connected with our free Wi-Fi throughout the hotel. Get the most out of your stay with our 3 meeting rooms and 1 ball room with up to 300 persons capacity. Enjoy your day for a little shopping or spend your evening time at the VVIP Karaoke.